Yesterday was my birthday and I spent a very special of quite a few memorable moments in a stand of white birch trees in the woods of midcoast Maine, under a clear sky, talking to my sister by cellphone. It is always a day of reflection, as it comes exactly a week after New Year's and for me the real beginning of a New Year. I celebrate several new beginnings a year; the Jewish New Year, the Julian New Year, my birthday and the Chinese New Year. Life is ever begun anew and especially this year. Today is Elvis' birthday. 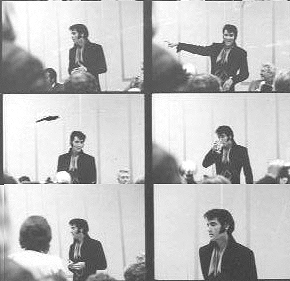 Here are some frames from the contact sheet of pictures I took of Elvis at his press conference during his 1969 debut at the International Hotel in Las Vegas, a sold out engagement which marked his return to live performing. I was lucky enough to attend, courtesy of Kirk Kerkorian, owner of the International. I realized that if I lived long enough, all my wishes would come true. What I, or any young girl, would not have given in the nineteen fifties to see Elvis in person from the first row. At the time it wasn't as big a deal to me as a Who or a Rolling Stones concert, but in retrospect, the uniqueness of the event sits side by side with other peak experiences. After the performance, we (the press and other invited guests) were herded into a nondescript room near the showroom, where Elvis gave an unannounced, but nonetheless triumphant, press conference. These are some of my never before published pictures from the 2x contact sheet of that delightful confab with an ebullient Elvis Presley. "Do you have to be as reclusive as you used to be?" I asked. He chortled and said "I'm not that reclusive, really, I'm just sneaky." One snotty woman asked "Do you dye your hair?" and Elvis answered "Oh, c'mon." I was lucky to get these pictures. You can read the rest of my account of this adventure on my website. They say Jim Morrison was the lizard king; Elvis Presley was the gizzard king. 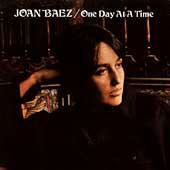 Tomorrow, January 9, is the birthday of the lovely folksinger and activist Joan Baez who was born on the same day as disgraced American president, Richard Nixon. This picture is the album cover, appropriately enough, for One Day At A Time. So in a 3 day succession (though not in the same year, of cuss) me, Elvis, Joan and Nixon and I say: a great week for menaces to society.